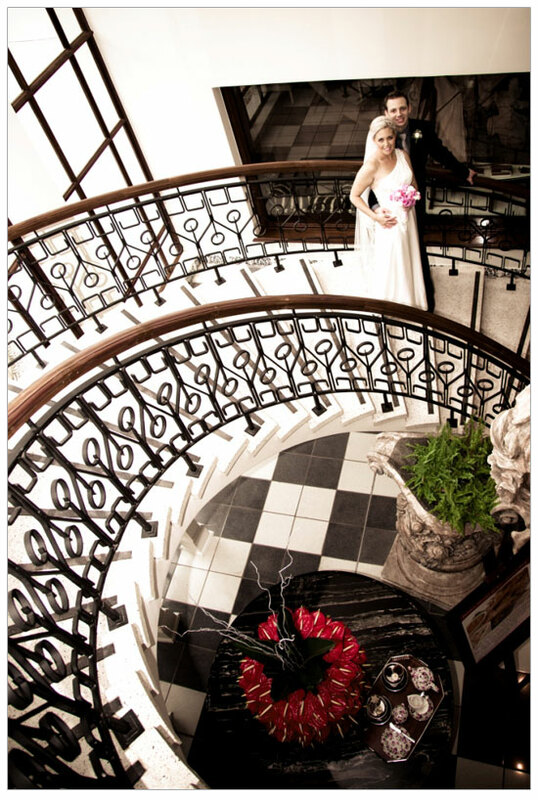 Lindsay and Murray had the privilege of getting married in one of the most sought out and glamourous wedding venues in Durban - so glamourous that the Princess of Monaco, South Africa's very own Charlene Wittstock, stayed there when she was visting South Africa. What venue could that be? The Oyster Box Hotel in Umhlanga of course! The bride looked beautiful and the groom looked dapper - a classic wedding, set in a beautiful venue, with a gorgeous couple - what more could you ask for? 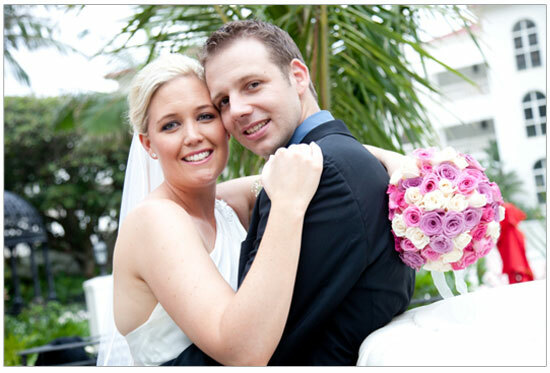 Lindsay Mackay and Murray Hardman wed on 16 December 2011 at the Our Lady Fatima Catholic Church in Durban North, with the reception held at The Oyster Box. Their theme was a pastel palette of pale pinks, purples and blues offset with cream and black bridesmaids dresses. 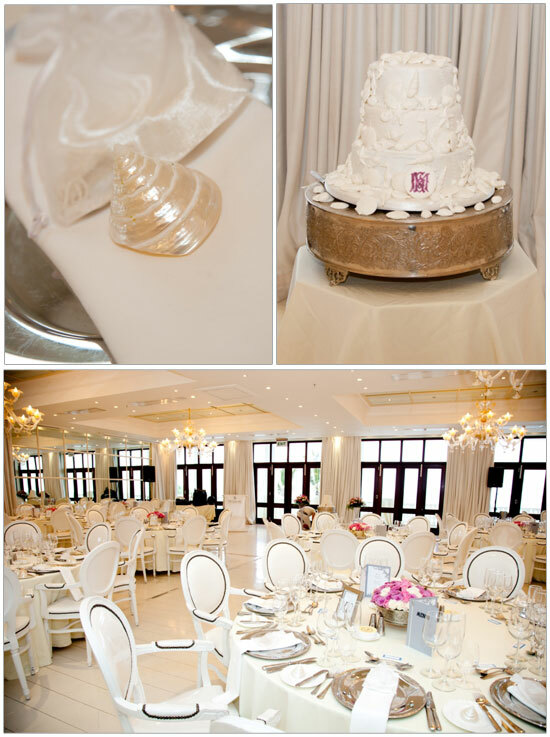 The idea was to bring in a bit of Old Hollywood glamour into the wedding with the Pearl and Shell room in the Oyster Box lending an influence into their décor. Murray and I had been dating for 6 and a half years. We met at a local Durban nightclub, which is ironic since we are not the club type and haven’t been clubbing since then. The first two years of our relationship was challenging as I was studying in Pretoria and Murray was studying in Durban. However, even with the long-distance we were quite happy to make the sacrifice and both knew we were in it for the long haul. Murray and I had been speaking about marriage for a while. We were waiting for him to finish his degree. In December 2010 he asked my parents if he could marry me and we got a ring designed by a Johannesburg jeweller. Murray decided not to tell me when the ring was ready and began planning the proposal. Our usual once a month dinner date night became a night full of surprises. On the 1st December 2010 Murray said that we had reservations at the restaurant Moya but that we needed to stop at the Spinnaker building first to collect something for his work. The Spinnaker building is a very tall building in Durban and overlooks Ushaka Marine World and the city of Durban. Murray took me up the top floor we he had prepared a champagne and strawberry picnic. The weather was particularly bad that evening, with a storm with thunder and lightning fast approaching. Murray very quickly got down on one knee and asked me to marry him. Afterwards we took some pictures on the rooftop and then ran over to Moyo in the pounding rain. Murray had organised a very special dinner with roses and an isiZulu ballad that the staff sang to us. It was a magical night. What was the best lesson you learnt through planning your wedding? That is not about the actual wedding day but about the vows made during the ceremony and our marriage ahead that is important. ~ Be flexible with your ideas. Although everything seems possible in the American movies, not everything is available in South Africa. ~ Wear comfortable shoes. My shoes were stunning Nine West stilettos which photographed beautifully and made me very tall but after one hour of photographs, I was in a lot of pain and lost the feeling in my toes for three days after the wedding! ~ Try leave very little to do on the morning of the wedding. I did this and it made the day seem a little less rushed. ~ Remember that your family will be involved and telling you what to do, but its only because they are just as excited as you are. Give them some jobs to do so that they feel involved and enjoy having them part of the planning. ~ I got a professional make-up artist to do my Mom's make-up as well which made her feel special. ~ Go for pre-marital counselling. This made all the difference for us because once a week we were able to focus on our marriage preparation and not our wedding day preparation. 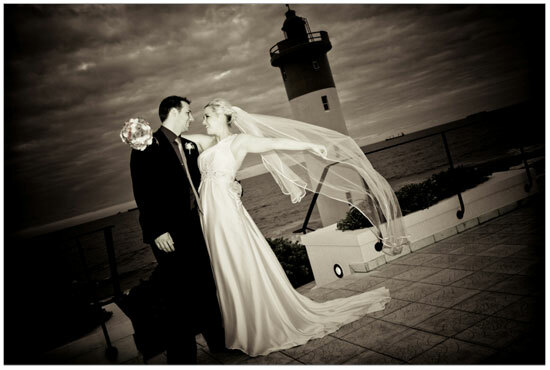 ~ Use a videographer to capture the day! It goes by so fast and I am so glad someone told us to use one. ~ Just before the ceremony and reception, pause for a few minutes and take it all in. Don’t let it rush by without enjoying the magic of the day. How did you decide on the colour or theme of your wedding? I originally wanted Hydrangeas as my flowers and really like the pink and blue hues of the Hydrangea plant. After speaking to the florist, I was advised to not have them as they would wilt in the Durban humidity. The florist advised roses and we chose pinks, purples and creams. I also wanted the bridesmaid dresses to be black, simple and very chic. I think the dark dresses and suits complimented the splash of colour. How involved was your husband or family in the wedding planning? Murray was not as involved in the planning as he had wanted to be because of his studies but he was part of all the major decisions. My family were very much involved in the planning of the wedding and had to have their ideas heard. Thinking about that now, it was great having their support. What would you change about your wedding day if you could? ~ I would have worn more comfortable shoes. 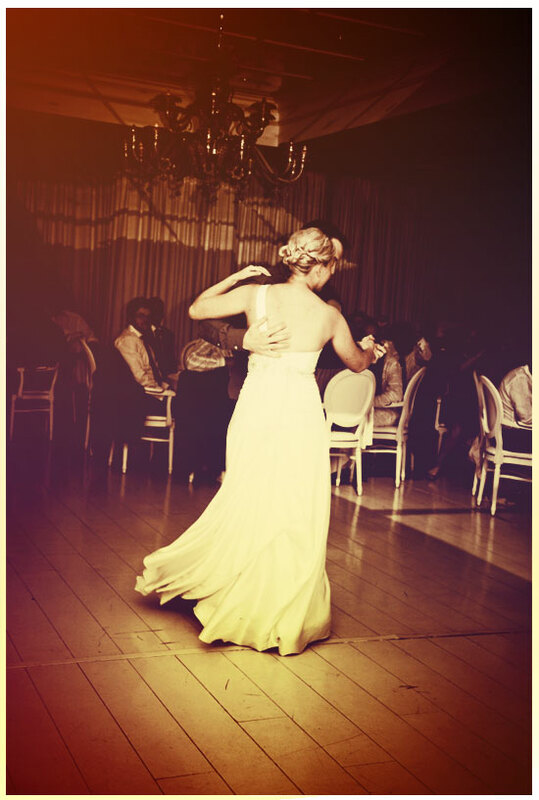 ~ I would have spent more time with my husband during the reception. ~ I would have taken the remainder of the chocolate cake home! It was so yummy and we never got a chance to really enjoy it. Were there any elements of your wedding that you did yourself? I did all the name tags, menus and seating plan myself. I am not the most creative person but went to Imagine That, a craft shop in The Crescent, which is packed with friendly staff who have loads of good ideas. Murray planned a surprise for me and the guests at the end of the reception. 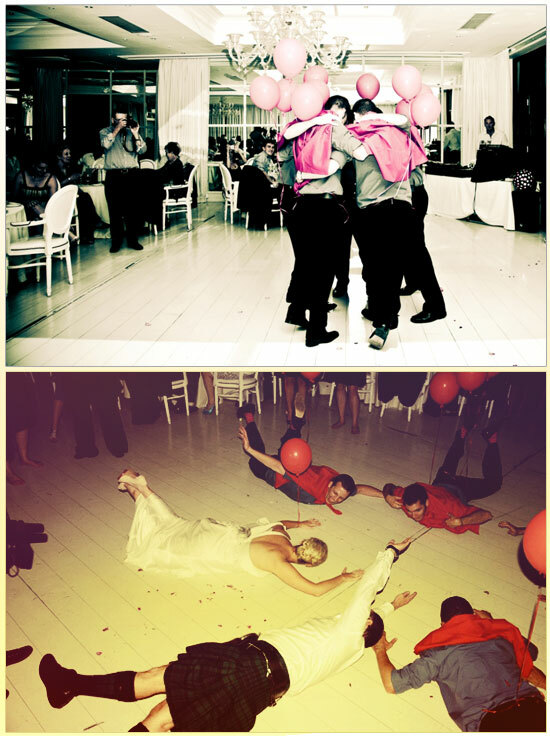 Him and his groomsmen entered the venue with red capes and balloons and did a weird dance to the song Free Falling, which is an old school tradition of his. In the final chorus I joined in and shocked the guests! We decided to not have a mushy song so we compiled something that incorporated a jazz, swing song with no words, which then went into Los Lappie. This was fun for us and the guests! What was the flavour of your cake? The cake was chocolate flavour and delicious! The top tier was Christmas cake that we took home and enjoyed on Christmas day. This was a really good idea because we could enjoy it so much more. Did you go on Honeymoon? And if so, where did you go? We went to Umngazi River Bungalows near Port St Johns. It was such a wonderful break, very relaxing and the food was superb. Stationary: All the wedding stationary was home-made and the invitations were carved out of wood from Jakarta, Indonesia. Dress (including bridesmaids dresses): My dress was from Sposabella and my bridesmaids dresses were made by Carol Palmer (031 564 5621). Flowers: Sandy from Flora Flowers helped us.They were fantastic. They didn’t pressure us into getting the most expensive flowers and had really good ideas (031 208 7095). We would love to see your wedding! If you would like to feature it on our blog, email us at rubyandtheswallow@gmail.com!